There are probably a lot of games that I should write reviews for before doing this one, but I really feel like striking while the iron’s hot on this one. So… Eminent Domain is nominally a “deckbuilding” game with a space-empire theme, but I’ve found it to be significantly different and, in most cases, better than the pretty much all the rest. I acquired my copy through backing it on Kickstarter and was very excited about it finally being released, and through a number of plays so far, my excitement about it has only increased. Whether you are a fan of deckbuilding games or if, like me, you’re sort of burned out on them, you might want to keep reading to see what Eminent Domain has to offer. 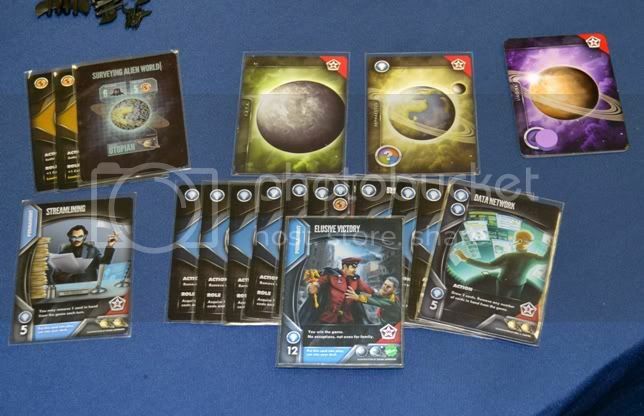 There are basically 3 types of cards in Eminent Domain: Role cards, Technology cards, and Planet cards. 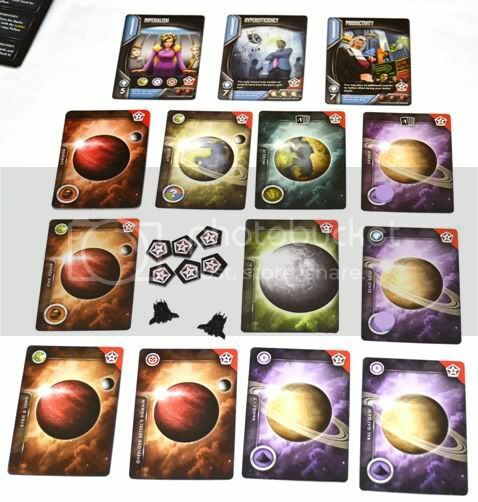 Role cards and Technology cards are added throughout play to the players’ decks, while Planets are kept separate. In addition, there are a number of molded, plastic fighter tokens in the game that mark the military power of the players, some wooden discs of different colors to serve as various goods, and a pile of cardboard Influence tokens, which are what the game calls its victory points. The goal of the game is to accumulate the most of these Influence points; both the actual cardboard ones and those pictured on cards in your deck and in play. Piles of the 5 basic Role cards (Survey, Warfare, Colonoze, Produce/Trade, and Research) are always available on a little board in the center of the table and also make up the players’ starting decks. And the core mechanic of the game is that on each turn, a player will choose and take one of these cards in order to use its ability. Deck “building” occurs mainly through this process of choosing a new Role card each turn, which then ends up in the discard pile to be drawn again later. Every player starts the game with one of the starting planets facedown in front of them. This and other Planet cards have two values on their backs: 1) the cost in military power (fighter tokens) to Attack the planet, and 2) the number of colonies which must be on the planet before you can Settle it. When either cost is paid, the planet is flipped over and may be used to produce resources, qualify for Technology cards, contribute its Influence to the player’s score, and occasionally other effects. Planets also have a Type, either Fertile, Metallic, or Advanced; which is mostly important for gaining Researching Technologies, but also affect which resources they will produce. Technology cards give players enhanced actions and special powers that affect how they will play the game, and they’re organized a couple of different ways. As I just mentioned, the first way they’re grouped is by which planet type they’re linked to, so to claim a particular Technology, you must control one or more planets of that type. – Level 1 require you to control at least 1 planet of the associated type and play 3 Research symbols (see below). They give some slightly enhanced action and have 2 symbols on them. – Level 2 require 2 planets of that type and 5 Research symbols to play. They have unique abilities and are worth 2 Influence. – Level 3 require 3 planets of that type and 7 Research symbols. As of right now, there’s only one for each planet type, and they’re worth 5 Influence. Most Technology cards are placed in your hand when you acquire them, but some Level 2 and all Level 3 Techs are Permanents, which mean that they go directly into play in front of you and stay there for the rest of the game. All Permanents are actually double-sided, with different abilities on the two sides, and you choose which one you want when you acquire it. 1) Action Phase – The active player may play one card from their hand to perform the Action listed on it. All Role and Technology cards have an action listed on them. 2) Role Phase – The active player must then choose one of the Role cards from the tableau and perform one of the Role abilities listed on it. In addition, the ability may be Boosted by playing more cards from their hand picturing the same symbol (usually other Role cards of the same type, but Technology cards may also be played in this way) and from symbols on planets already active in their play area. Some Roles also grant a small Leader Bonus ability for being the one who actually chose the role. This is significant because after the leader completes the Role, other players will then have the choice to either Follow the Role by playing cards of the matching symbol from their hands or to Dissent and draw a card. 3) Cleanup Phase – The active player finishes their turn by discarding any number of cards (of their choice) from their hand and drawing up to their hand limit, which is normally 5 cards. Survey – As an action, it lets you draw 2 cards. As a role, you get to look at cards from the top of the Planet deck equal to then number of Survey symbols you play and choose one to place facedown in your play area. Followers look at one less card than their number of played symbols. Warfare – Lets you collect fighter tokens equal to the number of Warfare symbols you play. As the leader of the role or when played as an action, you may instead discard fighters equal to the military strength of a planet to Attack it and flip it over to its active side. Colonize – Lets you place the Colonize cards played underneath planets as colonies. If a planet already has colonies equal to its colonize cost, you can instead discard those colonies to Settle it and flip it over to its active side, but only if you led the role or played it as an action. Produce/Trade – Allows you to either add a resource token to en empty resourse slot on a planet (Produce) or discard a resource token to gain 1 Influence (Trade) per symbol played. The leader of the role chooses which (Produce or Trade) to do, and all others must follow that action. Research – As an action, you can play this to remove up to 2 cards in your hand from the game. The role lets you take one Technology card into your hand that you qualify for, based on the planets you control and how many Research symbols you play. You play until either the Influence tokens run out or until either 1 or 2 (depending on the number of players) Role card piles runs out. But you still finish the round, so that everyone has the same number of turns. When I first played Eminent Domain, the first thing that stood out to me was how different it felt from all the other “deckbuilding” games I’ve played before. Rather than having a linear, “use resources to buy stuff” deckbuilding mechanic, your deck in Eminent Domain develops as a result of the choices you make in your Role phases. After my very first play, I called it more of a “deck-learning” game, beacause your deck really does seem to learn and get better at doing the things you do most. This totally changes the nature of the decisions you make each turn. In most deckbuilding games, the decision about what cards to add to your deck is mostly one-dimensional. In other words, you get the card that you need to tune your deck like you want it to be, with little other consideration. In Eminent Domain, however, my main concern in a turn is usually more about the ability I want to use right then, rather than the effect that having another card of that type will have on my deck. But at the same time, you can’t ever totally ignore the overall construction of your deck, or it won’t give you the opportunity to do the things you want to do later on in the game. Eminent Domain feels a lot more like Puerto Rico or Race for the Galaxy to me than it does like Dominion or Ascension. Part of this is that I rarely ever feel like I have totally wasted turns; you know, where you just didn’t draw enough money or some other resource to do the thing that you wanted to do. There’s still certainly a lot of optimization to do in getting the right cards in your hand to use a Role most effectively, but your decisions are never really constrained by not being able to afford the card you really want to get into your deck. Along these same lines of having more choice and control in play, I really like that Eminent Domain actually brings a hand-management factor into it as well. Unlike the cleanup phase of most other games in the genre, you once again have some real decisions to make about what to keep and what to discard in planning for your next turn. The luck of the draw still plays a part, of course, but between the ability to hold cards from turn to turn and having a good idea what cards are in my deck, I usually feel like I can make some well-educated guesses about what I’ll draw and what I’ll be able to do on my next turn. After my first play or two, I worried about there being a dominant strategy (heavy Warfare). Thankfully, however, I think that it is just more of an easier and more obvious strategy, because since then, I’ve seen all sorts of approaches to the game be successful. In fact, I’ve really become quite impressed by the different “paths to victory” I’ve seen from it. And in expanding more on this idea of different strategic paths, I’m also impressed with how non-linear some of those paths can be. Between the action of the Research cards to remove cards from your deck and the abilities of a few different Technologies, there’s actually quite a bit of opportunity to sort of “shift gears” mid-game and take your deck in a different direction. Once again, it conjures up feelings similar to that in Puerto Rico or Acquire, where you have to judge not only what sort of moves to make in the game, but also when to make those moves and switch course. So let me switch gears a little myself and talk some about the scalability of the Eminent Domain, which is probably one of its weakest points. I don’t quite understand why they did this, but there are literally no changes in setup, number of cards in each Role stack, or number of Influence tokens between 2, 3, or 4 players. The only change is the game end trigger between either 1 or 2 Role card piles running out. This is not necessarily a bad thing, but this results in the game playing very differently with each number of players. I probably like the 3-player “long” game (to 2 empty piles) best, but I still have fun with any number of players. Another complaint I’ve heard about Eminent Domain is its lack of player interaction. And if you’re looking for lots of direct conflict and in-your-face confrontation, you’re not going to find it here. But when I play, I always feel like I’m interacting with the other players in more subtle ways. Most obviously, you’ve got the ability to either Follow or Dissent each turn, which serves to both keep players involved when it’s not their turn and also makes you keep at least one eye on what everyone else is doing. If you look closely, there’s a lot more chance to play both offensively (to leech off of others’ Roles) and defensively (not to set others up) in choosing which Roles to take and when to take them. Eminent Domain is a refreshing “deck-learning” game that continues to impress the heck out of me. • Rules: Simple turn order and basic roles, but the Technologies have a bit of a learning curve. • Downtime: Minimal, and the Follow/Dissent mechanic keeps you involved when it’s not your turn. • Length: With 2, the game can drag a little bit, but I’ve never really felt that it overstayed its welcome. • Player Interaction: Indirect, but present. Haven’t played Eminent Domain enough yet to have any strong feelings on it, but my few plays have been fun. I agree that while it has a lot in common with other deckbuilding games it feels quite a bit different. 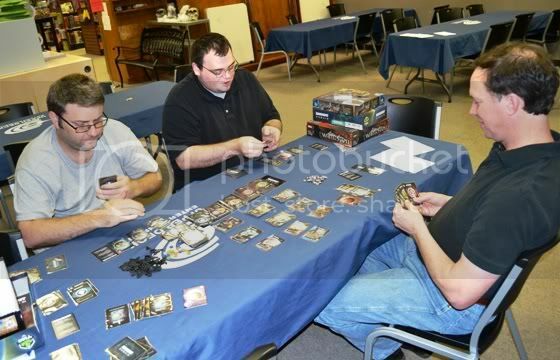 in your Elusive Victory picture it looks like you have one card too many. i don’t see any planets with a +1 hand size so if you started with 5, dissented 4 times, and chose research as your role, you should only have 10 cards but you’ve played 11. I started with 5 cards, dissented 3 times (3 other players in a 4-player game), played Improved Survey (draw 3 cards) for my action, took the Research role, and played a total of 11 cards worth 12 Research +1 bonus Research for good measure from my planet. Previous Post: Preorders, Promos, and the freaking definition of “Exclusive”!